We invite you to join us in worship here at St. John Evangelical Lutheran Church. We are a congregation called to a living Faith. We encourage daily faith practices such as prayer, study, worship, inviting, encouraging, serving, and giving; those actions that enable us to live and grow as disciples in Christ. They come out of scripture but they are lived in the world. They "grow out of love, and integrate love of God, neighbor and self in ways that can transform the world." Worship is central in our life where we hear God's Word and receive Christ's forgiveness in the Sacraments. That continues with regular Bible studies, Women's and Men's groups, an active Youth Ministry, catechism and Sunday School classes, vocal choirs, outreach ministries that support communities needs, support of scouting, AA, and other groups. We believe in a God of love who cares for you! Come and worship with us! 25th Anniversary of Pastor Aucker’s Ordination to Word and Sacrament Ministry. There will only be one worship service that day at 10:30 a.m. with Bishop Collins, Bishop of the Upper Susquehanna Synod preaching. A reception will follow in the Sunday School Room. The Reverend Doctor Kerry Aucker began his studies at Bloomsburg University earning a Bachelor of Science degree in Secondary Education. He received his Master of Divinity degree from Wartburg Theological Seminary in 1992, and was ordained in 1993 at Zion Lutheran, Turbotville, PA. Pastor then came to St. John in 1999 and continued his education to earn a Doctor of Ministry degree in Congregational Mission and Leadership from Luther Seminary, St. Paul, Minnesota in 2013. He has completed a number of courses in adolescent development and crisis counseling from Penn State and the International Critical Incident Stress Foundation, in Baltimore. 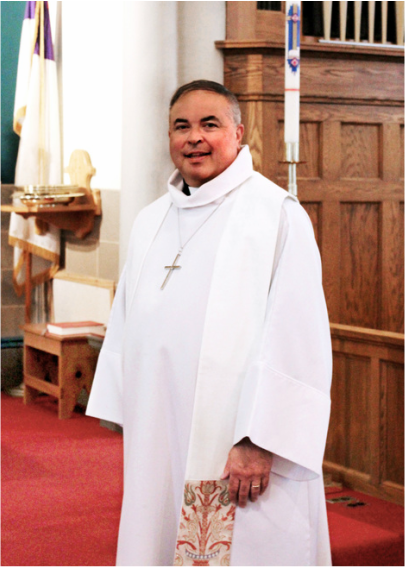 Pastor has recently been involved in the Jersey Shore Ministerium, was an organizer of the Jersey Shore Summer Recreation Program, a volunteer EMT and Paramedic, and an Administrator of the New Love Center Food Pantry, located at St. John. Currently at St. John, he participates in Family Promise, Relay for Life, and Meal Packaging projects for the hungry, as well as having served 18 years as a committee member for Big Brothers/Big Sisters, as President of the Board, and a "Big." When not at church, Pastor enjoys biking, hiking, and kayaking with his wife, Karen; and chocolate. The Reverend Barbara J. Collins was installed as the third bishop of the Upper Susquehanna Synod of the Evangelical Lutheran Church in America (ELCA) on Saturday, October 29, 2016. The Reverend Elizabeth Eaton, presiding bishop of the ELCA, installed Collins at a worship service held at Zion Lutheran Church, Sunbury. Eaton also preached during the service of Holy Communion. Dr. Karla Bombach, Synod Vice President, served as assisting minister. Participants in the service included pastors and members of synod congregations as well as synod staff, family of Bishop Collins, and Nancy Gable, ELCA Region 8 Coordinator. In addition, many Lutheran bishops and ecumenical partners offered blessings of the new bishop and participated in the service. Ecumenical partners included Bishop Ronald Gainer of the Roman Catholic Diocese of Harrisburg; Father James Lease of St. Joseph’s Roman Catholic Church, Danville; Joy Kauffman, General Presbyter of the Huntingdon Presbytery of the Presbyterian Church (USA); Williams Knudsen, Executive Presbyter of the Northumberland Presbytery of the Presbyterian Church (USA); Douglas Kleintop, a Bishop of the Moravian Church in North America; and Annetta Kuhn of Ansbach-Würzburg Kirchenkreis in Bavaria, Germany. The installing bishops included The Right Revered Nathan Baxter, retired bishop of the Episcopal Diocese of Central Pennsylvania; Rev. Robert Driesen, retired bishop of the ELCA Upper Susquehanna Synod; Rev. James Dunlop, bishop of ELCA Lower Susquehanna Synod; Rev. William Gohl, bishop of the ELCA Delware-Maryland Synod; Rev. Richard Graham, bishop of the ELCA Metropolitan Washington, D.C. Synod; Rev. Ralph Jones, bishop of the ELCA Northwestern PA Synod; Rev. Wilma Kucharek, bishop of the ELCA Slovak Zion Synod; Rev. Kurt Kusserow, bishop of the ELCA Southwestern PA Synod; Rev. A. Donald Main, bishop emeritus of the ELCA Upper Susquehanna Synod; Rev. Michael Rhyne, bishop of the ELCA Allegheny Synod; Rev. Samuel Zeiser, bishop of the ELCA Northeastern PA Synod. Collins was elected as bishop at the Synod Assembly held in June at Susquehanna University, Selinsgrove. She began a six-year term on September 1, 2016. She succeeds Bishop Robert L. Driesen, who retired on August 31, 2016, after nine years in office. Driesen presented Collins with the bishop’s crozier and a bishop’s ring and pectoral cross were also given to the new bishop. Collins, 58, previously served as the Assistant to the Bishop/Director for Evangelical Mission for the synod. She is a graduate of the Lutheran Theological Seminary at Gettysburg and Bloomsburg University, having also attended Penn State University. She served as pastor of Follmer Lutheran Church and St. John’s Lutheran Church, Potts Grove and as interim pastor and stated supply for Zion Lutheran Church in Kratzerville.